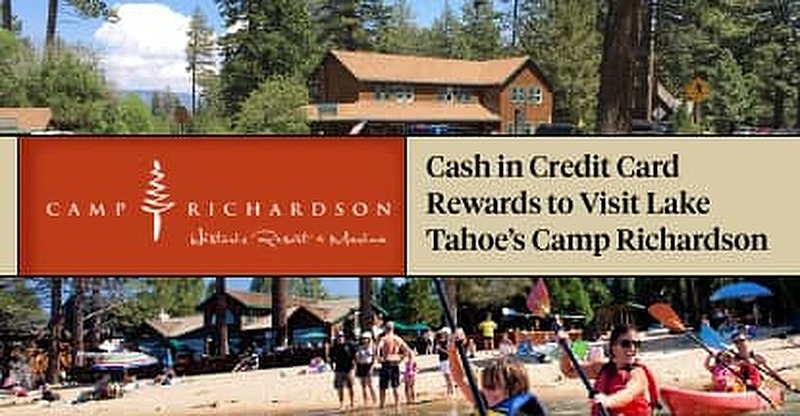 In a Nutshell: Camp Richardson is a year-round resort located on the edge of Lake Tahoe that is perfect for families who want to take advantage of everything the area has to offer. The camp is situated near historic sites, trails, watersports, and ski resorts. Redeem your travel rewards for a stay in one of Camp Richardson’s rustic-but-modern cabins and enjoy all of the on-property amenities — including a beach, restaurant, bar, coffee shop, and general store. Visitors can save even more money by visiting in the spring or fall, when the tourists take a hiatus and the trails and beaches are far less populated. Lake Tahoe is a picturesque natural playground that straddles the border of California and Nevada and caters to travelers of all types — from backpackers to billionaires. The lake’s tranquil waters welcome countless boaters during the summer and the surrounding mountains are covered with snow and filled with skiers during the winter. Travelers who prefer to live in the lap of luxury have plenty of five-star hotels from which to choose. And those who define relaxation as a roulette table and a roll of the dice can find what they’re looking for in one of the many casinos on the Nevada side of the lake. But if you’re looking to use your travel rewards to connect more with nature — or your family — Camp Richardson provides a relaxing getaway right on the water’s edge. The resort is a paradise for nature-lovers and offers trails, watersports, proximity to historic sites, and much more. The property dates back to 1875 and has been a favorite vacation spot for generations of vacationers since. The resort is so family friendly that it served as the primary filming location for the Season 9 premiere episode of the hit ABC sitcom Modern Family. With its welcoming atmosphere, spacious cabins, marina, ski resort packages, and beautiful, natural surroundings, Camp Richardson is a preferred destination for any season. While many visitors flock to Lake Tahoe for its legendary ski slopes, summer is just as popular, especially for Camp Richardson’s guests. And many have passed the destination down as a vacation tradition. The resort has accommodations for parties of all sizes, including a hotel, cabins, a marina duplex, and plenty of campground space. Guests also have easy access to activities all year, whether they are on the lake, on the trail, or at one of the historic sites nearby. Families return to Camp Richardson for generations because of its location and amenities. Favorite lake adventures include fishing, kayaking, paddleboarding and, jet skiing. Excursions on land often include hiking, mountain biking, or a visit to the Tallac Historic Site. And while it is nestled among the former vacation estates of millionaires, Camp Richardson is an affordable getaway spot, especially if you aren’t married to the idea of visiting in summer or winter. Visitors can have many of the same summer and winter experiences at a much lower price point if they visit Camp Richardson in the fall or spring. While the winter and summer months are packed with tourists and Lake Tahoe is bustling with activity, spring and fall are the quieter times of the year. These seasons welcome many younger and older couples who aren’t tied to kids’ school schedules as are families visiting during the summer. And the in-between seasons can offer their share of unique experiences. “In spring, you could wake up to a light dusting of snow in the morning, and by lunch, it has all melted and it’s a nice, sunny day,” Proctor said. Spring and fall are great times to visit Camp Richardson and avoid the winter and summer crowds. In addition to the weather, visitors to Camp Richardson during these times of year can also look forward to two other huge perks: deals and smaller crowds. But summer and fall aren’t the only times you can get a good deal on a stay at Camp Richardson, as it partners with local ski resorts in winter to offer packages for those who want the best of both worlds. Lake Tahoe is world-famous for the scenic outdoor activities near its basin as well as the ski slopes and resorts in the surrounding mountains. Camp Richardson understands that many visitors want to experience the best of both of those worlds. That is why it partners with area ski resorts to offer special packages for those who want to stay in a more natural setting while taking advantage of ski resort amenities. Lake Tahoe is home to 12 ski resorts in the area and Camp Richardson is close to both Heavenly Mountain Resort and Sierra at Tahoe. “Camp Richardson offers packages in partnership with local resorts that can include dining, lift tickets, and even breakfast,” Proctor said. New specials are introduced each year, and those interested in learning about the packages can sign up for notifications when they are available. As the site of countless family vacations over the years, Camp Richardson is an inviting destination on the edge of Lake Tahoe. And cashing in those unused credit card travel rewards will go a little farther at Camp Richardson than one of those five-star ski resorts — plus you’re closer to the trails, water, and historical sites. Getting away from the grind and connecting with nature at Lake Tahoe can be an enjoyable experience, especially with family, and with so many accommodation options, you don’t have to leave anyone behind. So, if you’re thinking about visiting Lake Tahoe with those air miles you’ve racked up on your credit card, catch a flight to nearby Reno International Airport and visit Camp Richardson to see everything the area has to offer.